Few days back, i wrote about the major change in the way Kaspersky Licensing work for the 2010 versions with Kaspersky removing license activation of its product with keyfile. Today i will be talking about some of the other changes in its Internet security compared to previous versions. The first major change i saw when i was installing it on my system. THe installation process now provides more custom options right at the time of install. You can choose which component of internet security you want to install or not. 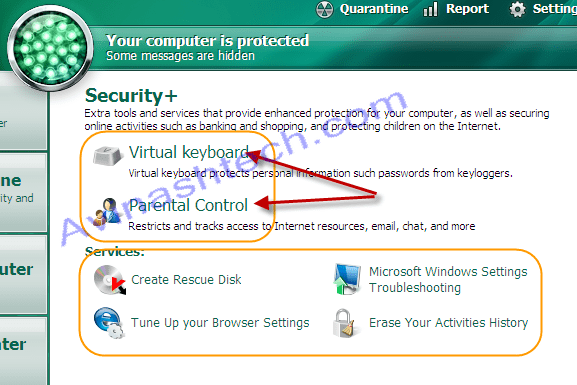 As you can see, it gives you option to selectively install all of its components like IM antivirus, Anti-spam, Parental Control, Virtual keyboard and many more. IF you dont wana install some of the components you can select that right at the time of install. Another change that i already talked about in my previous post is the way it lets you activate it. You can read about it here. After installation, you see a new and improved layout and menu options with different functions and options organised much better than previous versions. The new menu is much better compared to old ones. Making it visibly clearer making it simple for a novice user to find what he/she needs. Also you get a live feel of files being scanned in real time with the files scanned being shown with a animated slider. When you start using your browser, you will find two new icons on your browser address bar being added by kaspersky. One of them is for virtual keyboard and other one for URL advisor. Also you get options like tweaking your browser settings, creating a Rescue CD , Erasing your activities history etc. All these options give you more control and options for you helping you use your system with confidence. Without worrying about viruses, phishing scams , malwares, trojans etc. Apart from these, the memory use on the system was better than the previous ones i.e. it used less resources. Also the scanning time for files on the system was better. I am not quoting the exact time and memory here as i dont have relevant data for previous versions. I am writing this based on my personal feeling. Also, the virus detection abilities are great with kaspersky, so i wont write about it here. If you want to try its 30 day trial, you can download it here.